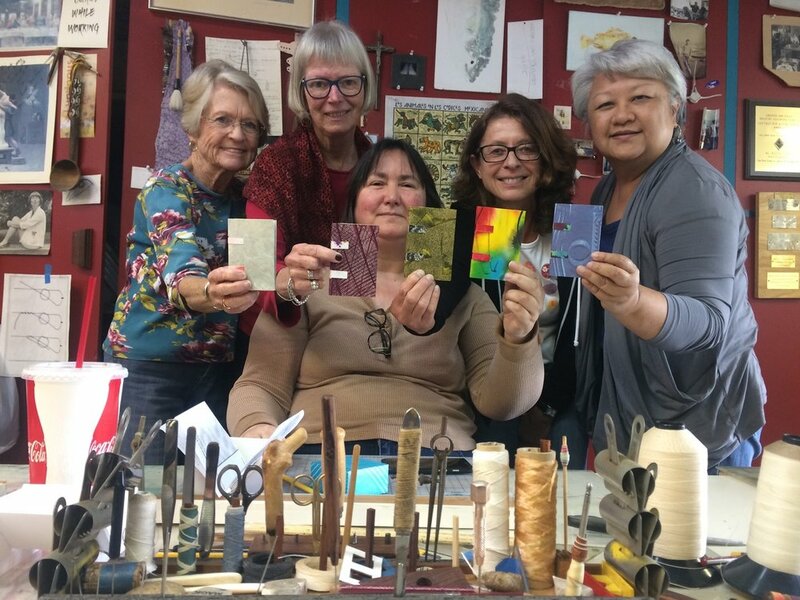 Whether you're new to artists' books or a long-time practitioner, San Diego Book Arts offers opportunities to learn new things. Whether it's a Workshop with internationally known artists, a Book Arts Basics class or a Free Community offering, the format is the same: dive in, get your hands dirty, and amaze yourself. Each year San Diego Book Arts sponsors hands-on workshops led by internationally recognized book arts specialists. Most classes are accompanied by an evening artist's lecture that is free to the public. Workshops cover such topics as historic and innovative bindings, paper making, surface decoration, mixed media, and developing ideas and book content. In addition to a wide variety of papers and paper-based media, students have the opportunity to work with leather, wood, plant fibers, mica, Dremel tools, and even sewing machines. In 2018 we are offering workshops ranging from one-day classes to three-day intensives. The roster of presenters includes outstanding book artists from around the country. If you are interested in taking a workshop, we recommend signing up soon, as they do fill up fast. You may pay your registration fee online with a credit card or mail a check, payable to San Diego Book Arts, to 1624 Forestdale Drive, Encinitas, CA 92024. (Please send a separate check for each workshop.) All classes also include a materials fee payable to the instructor. We will contact you to confirm your registration and provide details about the class. SDBA has an Early Enrollment Program that offers members a 20% reduction on the member price if registration is paid in full 61 or more days in advance of the workshop. No refunds of tuition are available with this option. Members who are unable to attend a workshop they have signed up for under the Early Enrollment Program may transfer the registration to another current member or donate the amount paid to SDBA. Arranging a transfer is the responsibility of the members involved. If a workshop is canceled by San Diego Book Arts, Early Enrollment Program fees will be refunded. Standard member and non-member registration fees are refundable up to 30 days prior to the workshop. For cancellations less than 30 days prior to the first day of the workshop, the student will forfeit the full workshop fee. If a refund is requested more than 30 days prior to the start of the workshop, the student will be refunded the registration fee minus a $50 cancellation fee. There are no refunds once the workshop has started. If a workshop is canceled the full fee will be refunded. Book Arts Basics workshops were created in 2016 to provide introductory bookmaking instruction and give members an opportunity to teach and share their skills. The 3-hour classes are reasonably priced and all result in at least one completed book and a handout to take home. For those new to the world of artists' books the Book Arts Basics series offers SDBA members and the community at large a way to explore different book forms and related arts such as paper decoration, stamping, and collage. Occasionally one of our San Diego Book Arts members may offer a workshop presenting a more advanced project that needs more instructional time. These classes provide an opportunity for participants to expand their skills in a small-group setting with plenty of hands-on guidance. These Beyond the Basics classes follow the one-day, affordable format of Book Arts Basics workshops. A student withdrawing from a workshop seven days or more prior to the class date will receive a refund, minus a $10 processing fee. If a student cancels less than seven days prior to the workshop, no refund will be provided. San Diego Book Arts is committed to introducing people of all ages to the medium of handmade books through hands-on projects. We offer classes and workshops for schools, libraries, community centers, museums, and other venues. Members of SDBA teach these classes with book structures suitable for the age and experience of the students. Participants enjoy an opportunity to work closely with practicing artists from their community, exploring opportunities for self-expression through text, images, and innovative book forms. SDBA can arrange a workshop for your organization. All materials are provided and presenters are fully insured. Sponsoring organizations pay a fee to SDBA for the presentation. To schedule a book arts workshop, use the Contact page with Arrange a Workshop in the subject line.